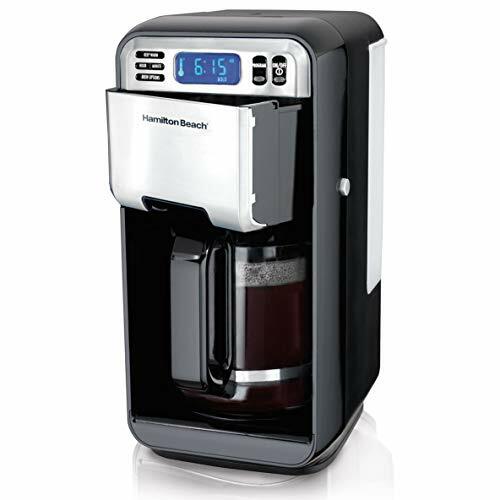 Hamilton Beach 46205 Programmable Coffee Maker Standard by Hamilton Beach at Jakis Cafe. MPN: 46205. Hurry! Limited time offer. Offer valid only while supplies last. Hamilton Beach 12 Cup coffee makers make consistently fresh, flavorful coffee - whether you're brewing a few cups or serving a large group. SWING OUT BREW BASKET WITH RELEASE BUTTON. With the touch of a button, the brew basket releases from the front for easy filling of your favorite grounds. NO SPILL SERVING. Automatic pause and serve lets you grab a cup during the brewing process without any overflow. Plus, the no spill pouring spout and nonstick warming plate make for easy, clean serving.